VOCAL has already proven that Voice over IP can provide a robust and reliable communication platform for server side modem applications with our SIP Analog Modem Server (SAMS) product. Combining SAMS with our Analog Modem Adapter (AMA) we are now providing a complete and transparent solution to support embedded and remote site modems in devices like POS payment terminals, utility meters, environmental sensors, and SCADA PLCs and RTUs. This end to end solution completely eliminates the requirement for analog POTS lines at the field location and instead transports the data stream over error free IP links which can be carried over Ethernet, WiFi, and LTE. 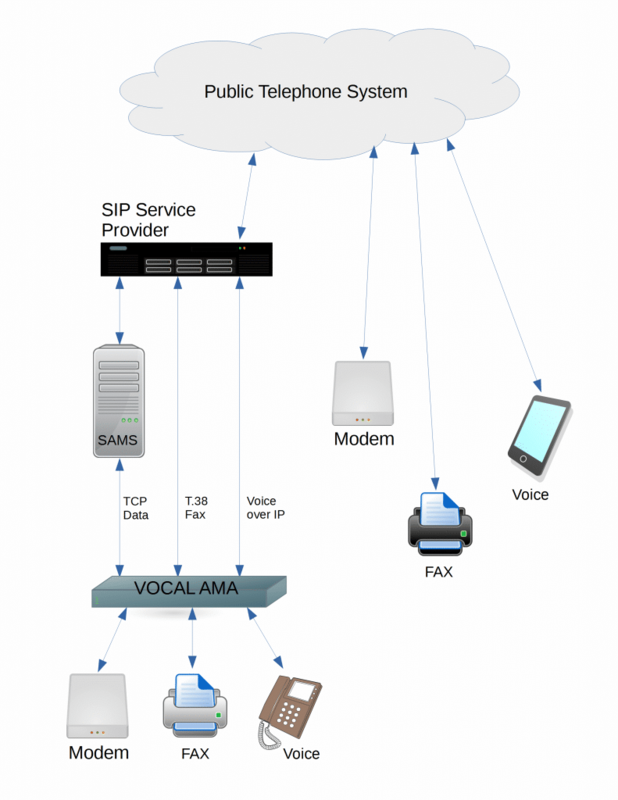 VOCALs AMA device is designed to provide either FXS connections to communicate directly with a modem, FXO connections to interoperate with telecom providers or other telecommunication equipment, or it can be configured with any combination of FXS and FXO ports. Deploying an AMA device means that existing field equipment can be used as-is without expensive modifications or replacements. Combining the AMA with SAMS results in a reliable “demod/remod” style modem relay. This means that modem data channels can be sent over reliable IP based transports while they traverse the non-ideal last mile connection. The data channels are forwarded to SAMS where they can be remodulated onto the public carrier network. This results in a completely transparent data channel where both endpoints can continue to operate without any changes. This configuration is ideal for VoIP service providers who still need to support customers utilizing traditional data modems or for any business or enterprise with a large modem installation base. VOCALs AMA can also be configured to support voice and fax over IP making this a perfect solution for creating fully integrated end user VoIP gateways and analog adapters.